Cohiba has come out with a new line of hand-rolled premium cigars for its esteemed cigar brand called Cohiba Blue. 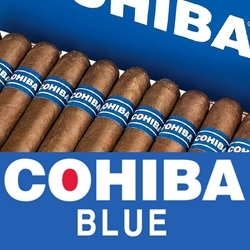 Packaged at 20 cigars in elegant bright blue boxes, every Cohiba premium cigar is infused with Honduran tobaccos used for both the wrapper and binder with fillers consisting of aged Dominican Republic Piloto Cubano, Honduras & Nicaragua tobaccos. Cohiba Blue are crafted individually by highly skilled cigar rollers at the General Cigar Dominicana factory in Santiago, Dominican Republic. Cohiba Blue premium cigars provides a medium-body smoking experience filled with sweet leathery notes and creamy earth tones. Smokers Discounts believes Cohiba Blue premium cigars are an approachable, everyday cigar…at an affordable price. We’ve made it easy to buy premium cigars online, with product delivered right to your front doorstep. A variety of sizes and flavors are listed below in our online cigar store. Each of these styles are in stock and available for a low discount price! Call us for more details!